This award is available to amateurs who have contacted at least 100 DXCC entities using 5 W output or less. Contacts made any time in the past count and no QSLs are required. 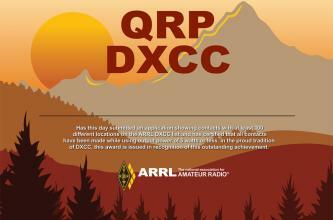 The QRP DXCC is a one-time award and is non-endorsable. You do not have to be an ARRL member to qualify. To apply for the QRP DXCC, just send a list of your contacts including call signs, countries/entities and contact dates. Do not send QSLs. The list must also carry a signed statement from you that all of the contacts were made with 5 W RF output (as measured at the antenna system input) or less. Along with your contact list, include $16 for US certificate shipments or $18 for international certificate shipments. Please include your fee in the form of a check or money order in US funds. Make sure to indicate your mailing address and your name as you want it to appear on the certificate. Mail everything to: QRP DXCC, ARRL, 225 Main St, Newington, CT 06111.